These peanut butter cookies are made with just 4 ingredients. It’s the perfect recipe to make from items in your pantry. The first time I tried these was at a relative’s house and it was a rainy day. A bunch of us were visiting together and having a great time. 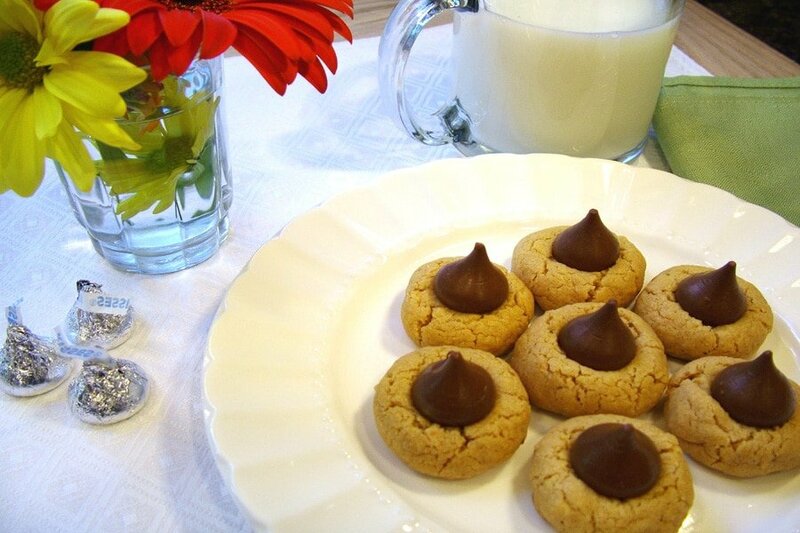 There happened to be some Hershey’s Kisses in the cupboard and a jar of peanut butter so we made these cookies. They were the perfect treat. These cookies really pack a punch too. They’re quite rich for such a small cookie. And they are so cute too. Unwrap about 30 or so of the Hershey’s Kisses. Put them in a bowl or plate and set aside. 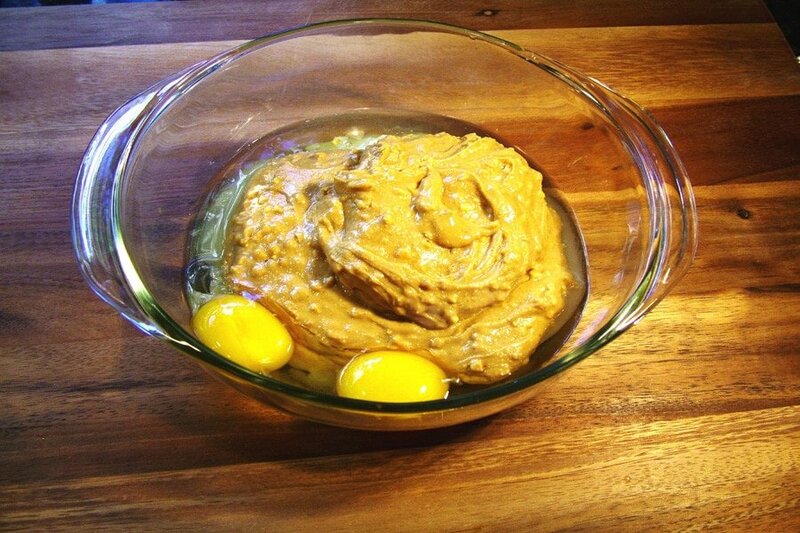 Combine the sugar, eggs and peanut butter in a bowl. Mix all ingredients with a big spoon. A wire whisk doesn’t work well with these ingredients, the mixture will get stuck inside the whisk so it’s best to use a large sturdy spoon. Before rolling the cookie dough into balls, rub a small amount of flour on your hands. Roll the dough into balls and put on a cookie sheet. Make the dough balls a little bit bigger than a whole walnut. Bake in a preheated oven for about 10 minutes. Make sure to watch them close because the bottom of the cookie can brown really fast while the top of the cookie doesn’t tend to brown. After about 6 minutes, take a spatula and slightly lift one of the cookies while they’re in the oven and check the brownness making sure they’re not getting too dark. 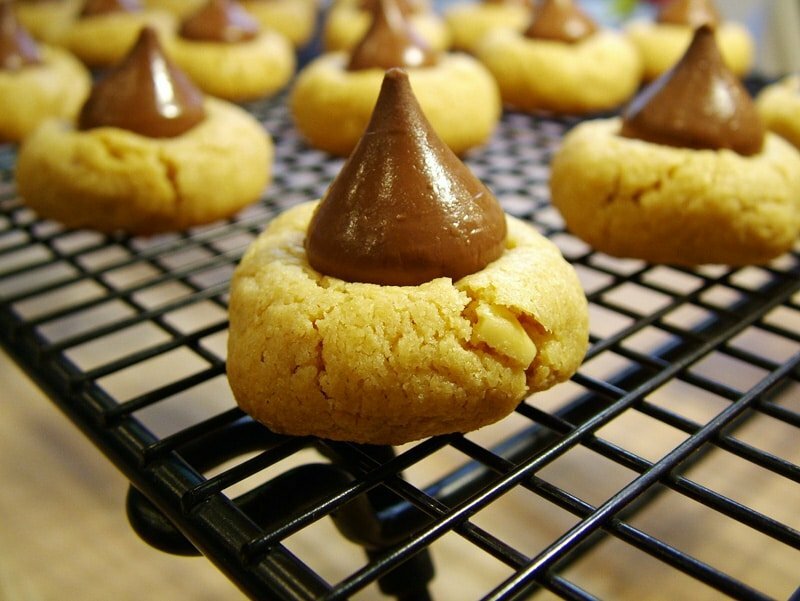 As soon as the cookies come out of the oven while they’re still warm and on the cookie sheet, put one Hershey’s Kiss on top of each cookie and gently push it slightly into the cookie. Remove the cookies from the cookie sheet and cool on a rack. They are delicious when eaten warm. As they cool they become more sturdy and the Hershey’s Kiss hardens back up again. Preheat the oven to 350 degrees F. Unwrap about 30 or so of the Hersey’s Kisses and put them in a bowl and set aside. 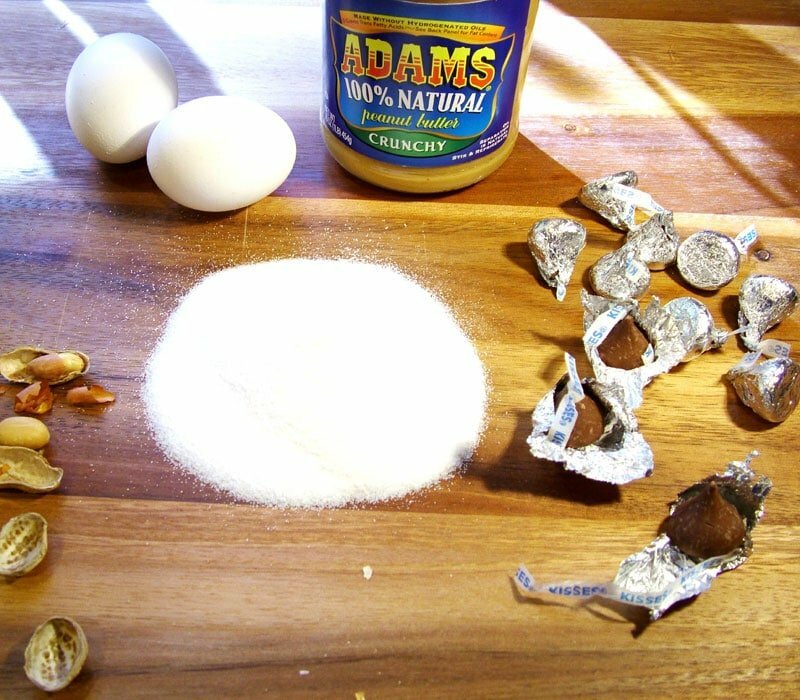 Combine the sugar, eggs and peanut butter in a bowl. Mix all ingredients with a big spoon (a wire whisk doesn’t work well with these ingredients, the mixture will get stuck inside the whisk so it’s best to use a large sturdy spoon). 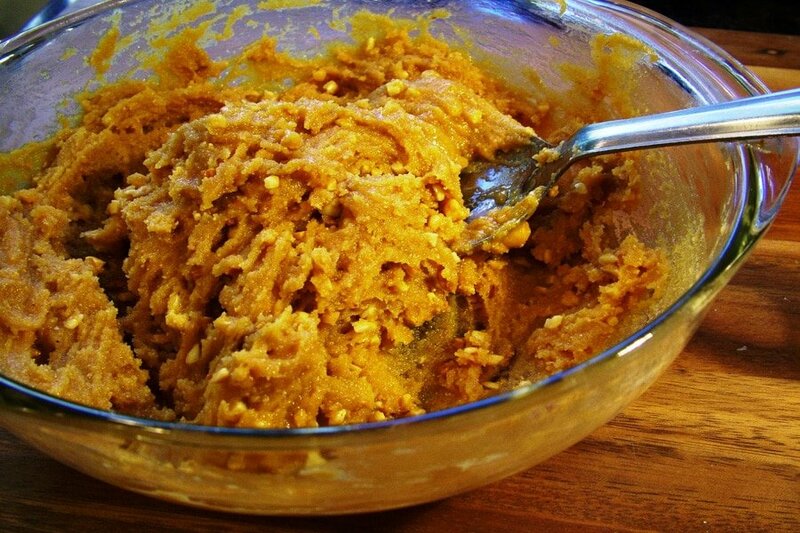 Before rolling the cookie dough into balls, rub a small amount of flour on your hands. 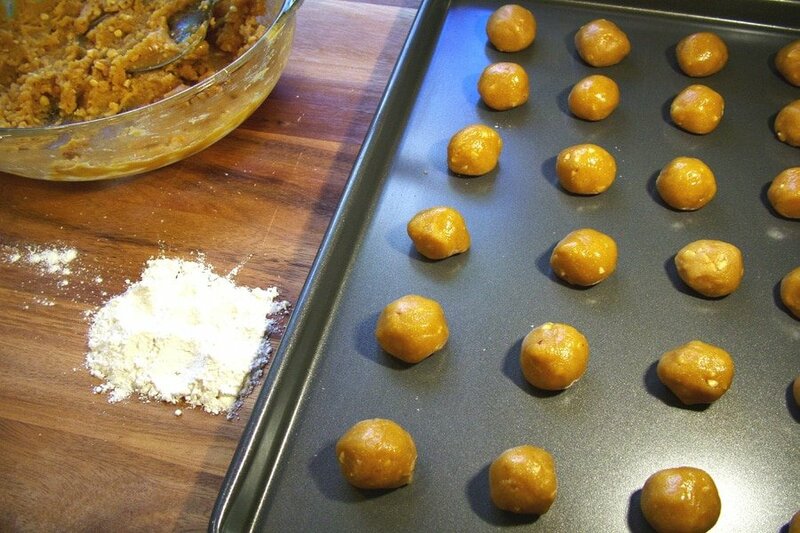 Roll the dough into balls and put on a cookie sheet. Make the dough balls a size that is a little bit bigger than a whole walnut. Bake in the oven for about 10 minutes. Make sure to watch them close because the bottom of the cookie can brown really fast while the top of the cookie doesn’t tend to brown. After about 6 minutes, take a spatula and slightly lift one of the cookies while they’re in the oven and check the brownness making sure they’re not getting too dark. 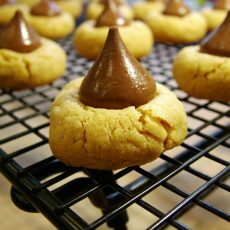 As soon as the cookies come out of the oven while they're still warm and on the cookie sheet, put one Hershey’s Kiss on top of each cookie and gently push it slightly into the cookie. 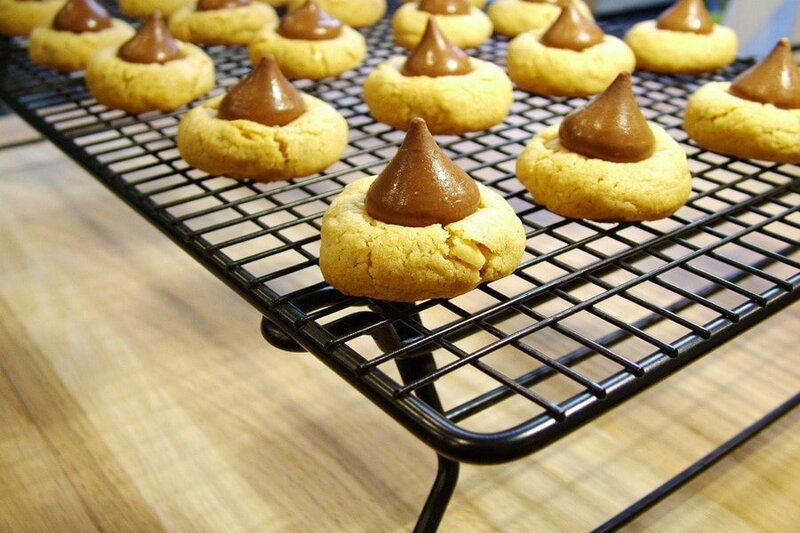 Remove the cookies from the cookie sheet and cool on a rack. As they cool they become more sturdy and the Hershey's Kiss hardens back up again. These look so good! i will definitely be making these, you cannot go wrong with peanut butter right? Jess, that’s for sure…you can’t go wrong with peanut butter!